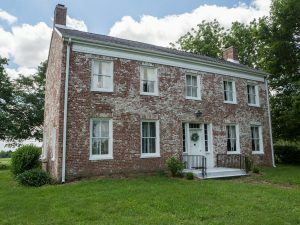 Come explore our historic sites on the Underground Railroad in Jacksonville, Illinois. The Underground Railroad (UGRR) is a term used to describe a secret network of meeting places, routes and safe houses established in the United States during the early to mid-1800’s. It was used by slaves to escape from their slave-holding southern states to the northern states and Canada. I once overheard Valerie, our young Assistant Innkeeper, telling our guests that the Underground Railroad “was not underground, nor was it a railroad!” I suspect she learned that from one of the books she read, and she’s right! Early Jacksonville was known as a center for abolitionists and those that supported them. It’s not hard to believe that we have several homes identified as safe houses on the Underground Railroad. On one of our first visits to Woodlawn Farm, the centerpiece, we parked a distance away and, looking into a wooded area, tried to imagine what it must have been like to run for one’s life, dependent upon the Lord above, the world around them, and the goodness of strangers. One of the first research papers I wrote as an elementary student was about Harriett Tubman, one of the conductors on the Underground Railroad. She was born into slavery and escaped, eventually leading many others to freedom. Though a heartbreaking time in our history, it’s interesting to read about the way they used clues to find their way. They might have known that moss usually grows on the north side of trees. Markings were made on dead trees. Many learned songs they could repeat to help guide their steps. Some believe that handmade quilts contained special patterns, or codes, that slaves memorized. 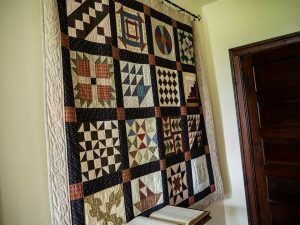 Since many could not read or write, it is believed that the patterns within the quilt helped escaping slaves receive directions and other messages. Think about how we plan our travel today. We first chart our route. Depending on what we plan to do, we typically check the weather. We may call or email friends and family to plan to get together. We often buy tickets and make dinner and tour reservations in advance. Now imagine what it must have been like for those traveling the Underground Railroad, and how desperate they must have been to take such risks. I’m sure they looked for clues regarding the weather, where they could find food, when they might meet friendly supporters, how many miles remained to their next stop, when they were going to have to cross large bodies of water, etc., all while facing ongoing threats from their surroundings, animals and people. What determination that must have required! Many homes in the Jacksonville area are believed to be linked to the Underground Railroad. The centerpiece historic site, Woodlawn Farm, offers seasonal tours and special events. Guided tours are available on summer Wednesdays, Saturdays, and Sundays from 1-4pm. UGRR Bus Tours are offered twice a year, and plans are underway for an Abolition/ Underground Railroad Museum to be located in the 1859 Congregational United Church of Christ building. 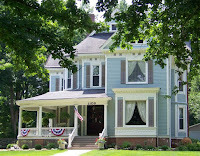 When you come explore the Underground Railroad in Jacksonville, Illinois, be sure to come stay with us at Blessings on State Bed & Breakfast. Put your feet up and relax after a day of touring. We’ll even make your dinner reservations! Clint Funk, one of my regular guests, recently toured Woodlawn Farm, with the caretaker as his guide. His photographs are used throughout this post, with permission. Experience a stay in our award-winning Bed & Breakfast located in a magnificently restored 130-year-old mansion in the heart of the historic district. We’re happy to help you plan your tour of the local historic sites. Pampered luxury is our goal, to delight both business and leisure travelers. We offer two upscale guest suites, each with private sitting rooms and private baths. We provide multi-course gourmet breakfasts, 24/7 family-friendly hot and cold beverages and snacks, and cookies and milk at bedtime. Wi-Fi is available throughout our home and each suite has a digital satellite TV and all-season fireplace. We are located just steps away from Illinois College, the Governor Duncan Mansion and Illinois School for the Deaf and our neighborhood is highlighted on one of Jacksonville’s historic walking tours. Escape the standard hotel room and enjoy your own private suite in the finest Jacksonville area lodging. Book direct for the best rates.